JASH “ACCU-FAB®” 2-D and 3-D welding tables are designed for accurate setting of welding jobs with convenience of welding in mind. They are available in various standard sizes as well as custom-built sizes requiring job configurations for welding e.g. in angles, stepped angles, different elevated vertical heights etc. 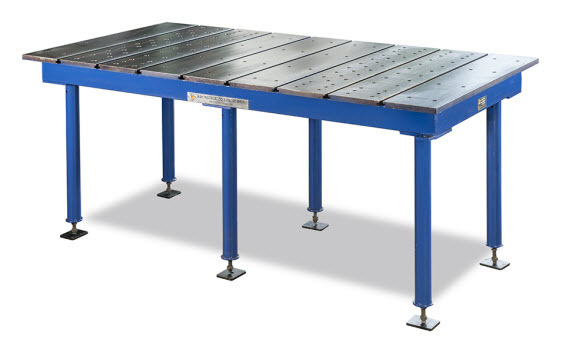 2-D JASH “Accu-Fab®” welding table can be converted into 3-D welding table by fixing four peripheral side plates or the runners of nominal depth 150 mm to 2-D welding table for length up to 1,800 mm and nominal depth of 200 mm for lengths above 1,800 mm. The standard working height of welding table leg steel pipes are adjustable, 875± 25 mm for levelling purpose. There can be lower or higher heights or differential heights as per work requirements. The material for top working surface runners is close grained GCI grade FG-260 (UTS 260 N/mm2 grade).